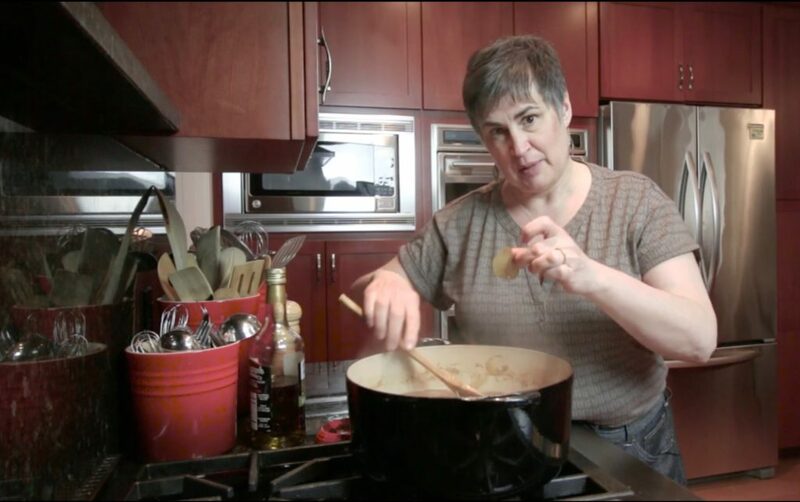 In a previous lesson we made caramelized onions That’s the hardest part of this recipe for French Onion Soup. Once the onions are done, the soup comes together in 30 minutes cooking time with only a few ingredients. While the onions are flavorful on their own, the addiition of a little cognac, fresh thyme sprigs and a couple of bay leaves enriches the soup. 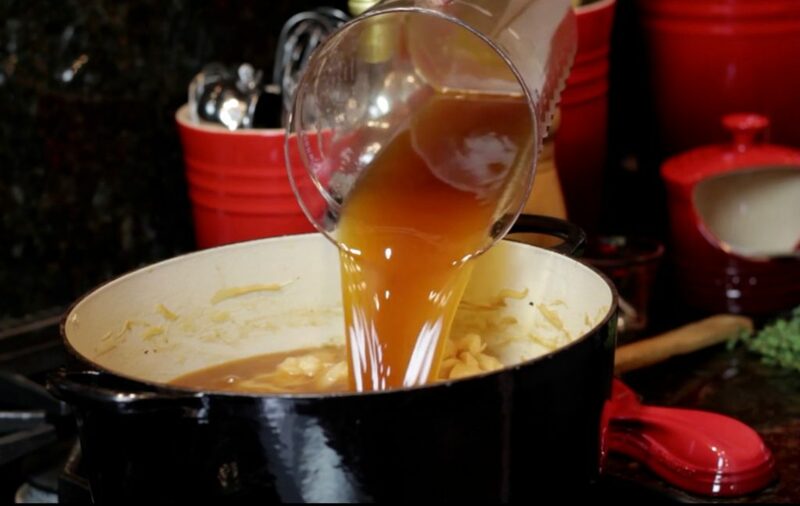 Traditional French onion soup uses beef stock. I prefer a roasted veal or roasted chicken stock. The beef is very strong and I find it overwhelms rather than complements the sweetness of the caramelized onions. Don’t forget to remove the thyme sprigs and bay leaves! Also in a previous lesson we demonstrated how to make cheesy crostini. These top the soup in lieu of the sheet of melted, gooey cheese that my daughter loves. I like the cheese melted on the crostini and then placed on top of the soup. 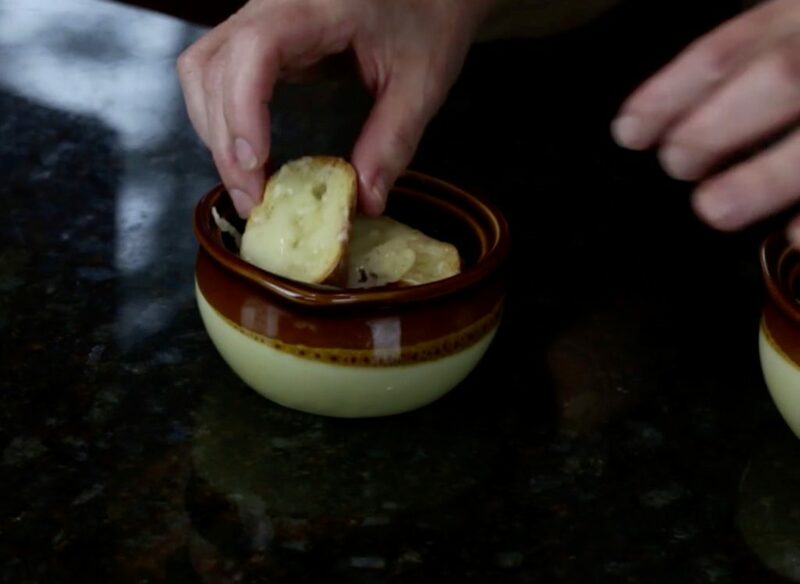 The dry bread soaks up the broth and the broth you get all that goodness in one spoonful. I put two in each bowl and a plate of extras on the table. Watch the French Onion Soup video here. Traditional French onion soup uses beef stock. I prefer a roasted veal stock or roasted chicken stock. The beef is very strong and I find it overwhelms rather than complements the sweetness of the caramelized onions. Combine the onions, stock, cognac, thyme, bay leaves and pepper in a large saucepan and . bring to a boil. Lower the heat to a gentle simmer, just a few little bubbles rising to the surface, and cook for 30 minutes. Ladle the soup into the bowls and top each with some cheesy crostini.